The DCI Southeastern Championship at the Atlanta Georgia Dome on Saturday, July 28, was the last show of the 2012 season prior to the World Championships when all World Class corps would compete together on the same day. Three more corps broke 90.0 at this show than at the DCI Southwestern Championship a week earlier. The scores of the two Effect captions are counted for full value, but with two judges in each Visual and Music Effect, the score from each Effect judge is averaged together with the score from the second judge in that caption. The scores of the three Visual and three Music captions are divided in half before being added to the final score, since each of those six judges score on a scale up to 20.0 max. Blue Devils (1st-93.15) continued its undefeated season by taking 1st in Visual Effect and 2nd in Music Effect, edging Carolina Crown in General Effect (the combination of both Effect captions) by 0.20. The corps won all three Visual captions, Proficiency, Analysis and Color Guard, a total of 0.50 over Crown. While 2nd in Brass (by 0.10 to Crown) and 3rd in Percussion (0.50 down to Cadets), the corps still won Total Music by 0.45, due to winning Music Analysis and because Crown was 7th in Percussion. (In San Antonio, BD Percussion took 1st.) Carolina Crown (2nd-92.00) was 2nd in Visual Effect and won Music Effect by 0.05. Visual Proficiency and Analysis both took 2nd, and Color Guard 3rd, for 2nd in Total Visual. Brass took 1st, Music Analysis 3rd (by just 0.30 under BD's 1st place in that caption, but still down 0.10 from a week ago) and Percussion slipped from 3rd in San Antonio, just 0.20 down from the leader, to 7th, a full 1.20 down from the winning Cadets line, resulting in 3rd place in Total Music. Still, Percussion accounted for only 0.35 of the 1.15 spread between the corps and Blue Devils. The spread between Crown and BD was actually greater in Total Visual (0.50) than it was in Total Music (0.45). Combined with the 0.20 deficit in General Effect, what's holding back Crown from winning is a little bit here and a little bit there. The Cadets (3rd-90.60) shocked many with that 1st place finish in Percussion, topping SCV's line by 0.30. Both Visual and Music Analysis and Brass placed 3rd, with all other captions in 4th. Music Effect, though, was only 0.05 under Phantom Regiment, with Visual Effect 0.35 under. The score for Music Analysis was exactly what it was a week ago in San Antonio. Phantom Regiment (4th-90.45) took 3rd in both Effect captions and Visual Proficiency and 4th in Visual Analysis and Brass. The corps' brightest spot was 2nd in Color Guard and its lowest was 6th in both Music Analysis and Percussion. While the score for Brass went up 0.90 from San Antonio, the score for Music Analysis went down by 0.20. Santa Clara Vanguard (5th-88.85) was once again 2nd in Percussion and now has two corps (BD and Cadets) to contend with to win the Fred Sanford Award in Indy that seemed predestined until the past week. Both Effect captions and both Analysis captions placed 5th. Visual Proficiency, Color Guard and Brass took 6th. Over the past week, the corps gained 0.50 on the 4th place score, but also lost 0.35 on its edge over the 6th place score. Bluecoats (6th-88.20) was 4th in Music Analysis and Percussion, 65h in Visual Proficiency and Brass and 6th in both Effect captions. Visual Analysis and Color Guard took 7th, just as the corps did last week. Boston Crusaders (7th-86.30) had caption placements spread from 5th (Color Guard) to 9th (Visual Proficiency and Brass). In between, the corps was 6th in Visual Analysis, took 7th in Music Analysis and tied for 7th in Music Effect, and placed 8th in Visual Effect and Percussion. If Music Analysis scored 0.10 higher to tie with Phantom Regiment, every Music caption would have placed higher than a week ago. The Cavaliers (8th-85.95) had their brightest finish with 5th place in Percussion. Visual Effect moved up to 7th from 10th in San Antonio, while Visual Proficiency and Analysis, Brass and Music Analysis all placed 8th. Music Effect finished 9th and Color Guard 10th. Madison Scouts (9th-84.90) only added 1.85 to its score over the past week, compared to the jumps of 4.45 for Cavaliers and 4.75 for Boston, both corps that placed under the Scouts last weekend in San Antonio. Visual Proficiency and Brass took 7th and Music Effect tied for 7th. Visual Effect and Visual Analysis placed 9th and Music Analysis 10th. The big problems for the corps are 13th place finishes in both Color Guard and Percussion, the latter caption dropping five placements and 0.70 in seven days. The next seven positions remained the same from San Antonio. Spirit of Atlanta (10th-83.40) took 8th in Color Guard and 9th in Music Analysis. Visual Effect, Visual Analysis, Brass and Percussion all took 10th and Music Effect and Visual Proficiency 11th. Blue Knights (11th-82.70) was 9th in Color Guard, 10th in Music Effect and Visual Proficiency and 11th in all five other captions. In San Antonio, both Music Effect and Percussion placed 13th. Blue Stars (12th-81.65) placed highest in Percussion, 9th place. The corps' lowest placement was 14th for Visual Analysis. All six other captions placed 12th. 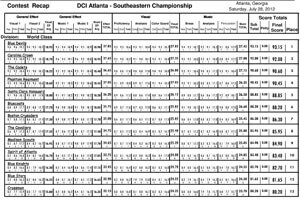 The corps opened up a spread over Crossmen from 0.20 last week to 1.45 in Atlanta. Crossmen (13th-80.20) placed in the top-12 only in Color Guard (11th) and Visual Proficiency (12th). Last week, the corps placed in the top-12 in five captions. Visual Effect, Visual Proficiency and Brass all took 13th, Music Analysis and Percussion 14th and Music Effect 15th. Glassmen (14th-79.15) placed in the top-12 only with 12th place in Percussion. Music Effect tied for 13th, Visual Effect and Visual Proficiency placed 14th, Visual Analysis, Brass and Music Analysis 15th, and Color Guard 17th, down from 13th last week with the exact score. The Academy (15th-78.00) once again had no captions in the top-12. (In Minneapolis two weeks ago, three captions placed between 10th and 12th.) Visual Analysis was 13th and Music Effect tied for 13th, Brass was 14th and Percussion 15th. Color Guard and Music Analysis finished in 16th and Visual Effect and Visual Proficiency 17th. Colts (16th-76.75) was 14th in Color Guard, tied for 15th in Visual Effect, took 16th in Music Effect, Visual Proficiency and Brass, 17th in Visual Analysis and 18th in Music Analysis and Percussion. Pacific Crest (17th-76.25) placed highest in Music Analysis, 13th, but once again took 19th in Percussion. Color Guard took 15th and Visual Effect tied for 15th. Visual Analysis was 16th and Music Effect, Visual Analysis and Brass ended in 18th. Troopers (18th-71.85) slipped a position, placing 15th in Visual Proficiency, 17th in Music Effect and all three Music captions, 18th in Visual Effect and Color Guard and 19th in Visual Analysis. Jersey Surf (19th-71.85) placed 18th in Visual Analysis, 19th in Visual Effect, Color Guard and Brass, 20th in Music Effect and Music Analysis and 21st in Visual Proficiency and Percussion. Mandarins (20th-71.75) closed up a gap between Surf from 2.85 to 0.10, placing highest in Percussion in 16th. Music Effect and Visual Proficiency placed 19th, Music Analysis 21st and the other four captions all finished in 20th. Cascades (21st-69.55) placed 19th in Music Analysis, 20th in Visual Proficiency and Percussion, and 21st in the four captions other than Color Guard, which ended in 22nd. Pioneer (22nd-66.30) was 21st in Color Guard and 22nd in all other captions. View the recap of scores from this event. Read more about this event.